Stoutmeister here. My last major stop during the Arizona spring break getaway was my old college haunt of Tucson. I attended the University of Arizona from 1996 to 2000, celebrating a national basketball championship and spending far too much time drinking instead of going to class. Remarkably they gave me a degree, and even more remarkably, the local newspaper hired me and kept me employed until the end of 2003, when I left for Southern California. Anyway, here is a review of Tucson’s two new(er) breweries. Time is on your side at Barrio Brewing. While the Sheriff took on the seasonal NCAAle, a double-strong American ale (10 percent ABV) named for the UA basketball team (which, yes, I realize did not make the tournament this season), I opted for the less potent Scotch Ale (7%) and the Nut Brown (5.6%). The Scotch failed to compare to the small taste I had of the Highlander Scotch Ale at Old World Brewery in Phoenix. This one had a sweet opening taste, but then went largely bland. I was disappointed, but undaunted I went on to the Nut Brown which was singularly … unmemorable. It had minimal flavor, which again was disappointing. I expected more, but then again, to this day I cannot recall a beer at Gentle Ben’s that stuck in my memory. On Sunday, I stopped by Barrio again, this time for dinner and in search of beer redemption. I had the Red Cat Amber Ale, which proved to be a tastier beer than Friday’s two varieties, surprisingly. Ambers are a very common style but in this case, Barrio did it quite well, offering up a smooth beer with good flavor and a little bite to keep you alive. After that I passed my car keys to a good friend so I could try the Nolan’s Porter, a burly, strong brew with a smoked, dry flavor. Though only 5.6%, it felt stronger, probably due to the flavor. It was worth every percent and every penny. Barrio earned some serious redemption on the second go-around. Beer lovers hang out in Borderlands' spacious venue while the trains pass just beyond the window. In between those two stops, I hit up Borderlands Brewing for a quick visit Friday afternoon. It was quick because Borderlands is only open 4 to 7 p.m. on Fridays. Though they advertise many more varieties on their Web site, Borderlands only had three beers on tap when I visited with another old friend from the Old Pueblo. He sampled the Wheat and Citrus IPA, the latter of which was verboten for me due to allergies. I had to stick to the Rye Lager, a strange-tasting beer that was not bad for its genre, but was not nearly what I had hoped for. Borderlands is fairly new and still working out the kinks of the operation at the old warehouse along the train tracks. I will have to revisit this location the next time I drop in on Tucson, just to see how things are progressing and to taste the Noche Dulce Moonlight Vanilla Porter that my friend Swede swears by. I skipped Tucson’s best-known brewery, Nimbus, on this trip, due both to the fact I have had many of their beers and their location is far out of the way. There are also Thunder Canyon Brewery, located in the far northwest part of town — too far to visit, but the good news is they are opening a taproom downtown soon — and Dragoon Brewing, which will soon open off Grant Road on the west side of town. 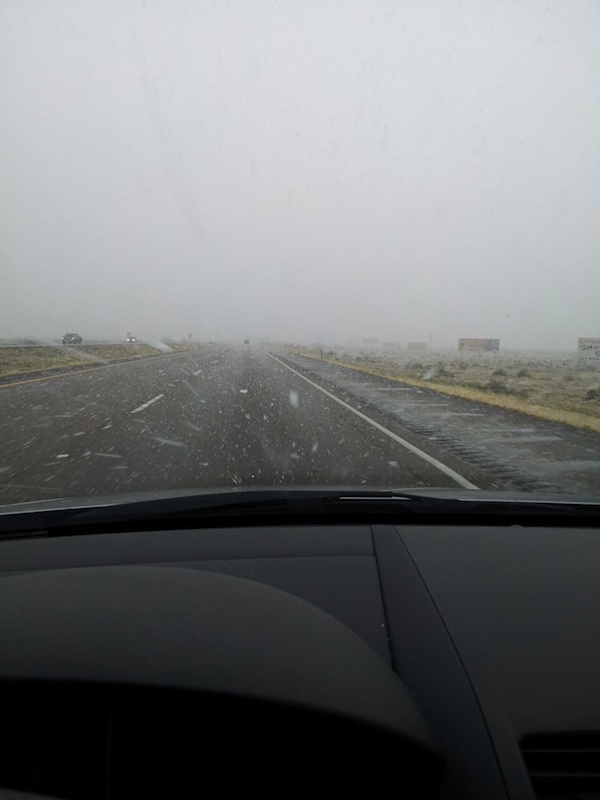 Interstate 10 was luckily light on traffic when the snow hit in force. Tucson is slowly playing catch-up to Albuquerque in regards to embracing the craft-brewing movement. In time it may be able to hold its own, but for now my college haunt does not measure up to my hometown. My Monday trip home was, well, adventurous. There was snow in places that normally never see it, most of it blasting across the road horizontally. (Insert “this is fine Scottish weather we’re having”) After surviving the snowapalooza between Tucson and Benson, between Benson and the Dragoon Mountain pass, between the border and Lordsburg, and finally between Lordsburg and Deming, I finally arrived in the Luna County seat eager to try Mimbres Valley Brewing Company. Despite the fact that their Web site lists the brewery as being open on Mondays, the sign out front said “closed” for all day (the site lists a 2-4:30 p.m. gap where it’s closed, apparently they just punted on the day because no one in Luna County drinks on Mondays, or something). I was disappointed in this, but then I started to notice pretty much every business in town was also closed. It was not as weird as the snowstorm along I-10, but it was close. So unfortunately I will have to wait until MVBC brings their beers up here for ABQ Beer Week May 17-27. At least they had better be up here, that week is going to be all sorts of awesome. Anyway, that wraps up my half of the Arizona adventure. If E-Rock finds time in between class and rehearsals, he will catch up on the other two Phoenix breweries we visited last week. Keep an eye out for the second Beer Battle: March of the Reds, coming as soon as we can get all five of us in the same place at the same time. As some may have read in our Beer Weekend post, E-Rock and I (Stoutmeister), have set off on a road trip of epic epicness to our neighboring state of Arizona. 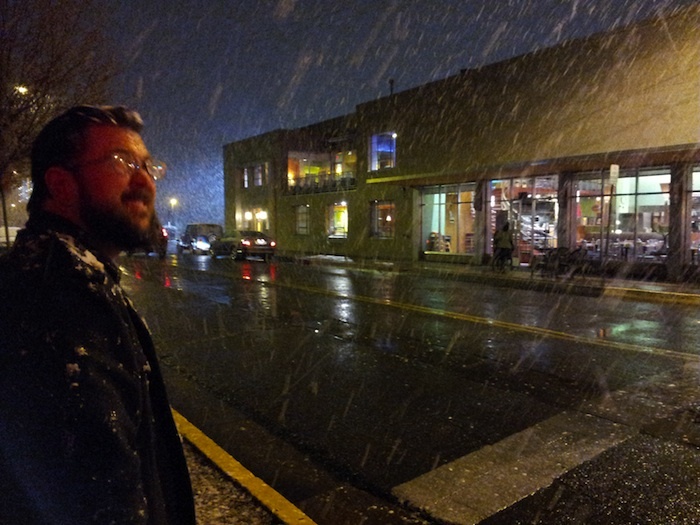 While E-Rock, brilliant in music and math but slow in typing, works on a review of Flagstaff’s landmark Beaver Street Brewery (it was his first visit, my 10th or so), here is a recap of what we’ve done so far and plan to do as we sample beers from around the state. The humble exterior belies the delicious beers that are inside Beaver Street Brewery in Flagstaff. Day One — E-Rock will have the Beaver Street recap up soon. After stopping there for lunch and beers, we continued south to the monolithic Phoenix metropolitan area, which is spread out all over the desert and now holds twice as many people as all of New Mexico (Wikipedia may not always tell the truth, but the census figures it cites do not lie … much). After dinner and a short time to unwind from the drive, we set out from our crash pad in Chandler to nearby Tempe, which has the greatest concentration of breweries largely due to the fact it has the greatest concentration of college students in Maricopa County. Since we had already been to Four Peaks, the area’s largest microbrewery, and Sleeping Dog is strangely closed Sunday through Tuesday, we stopped in at Dave’s Electric Brew Pub. The bartender was starting to close up, but he decided two more thirsty customers could not hurt. I snagged a couple pints of the Old Frog Grog, an oatmeal stout, while E-Rock sampled every variety of pale ale and IPA they had. We’ll have a more formal review up soon, but we would like to thank the DEBP staff for letting us in. Arizona State students were strangely MIA when we went to Dave's Electric Brew Pub just off campus. Day Two — Our plan is to trek as far west as one can in the metro area, to scenic Goodyear, to watch the Indians play host to the Diamondbacks. We are not fans of either team, though my college friend Shelley Duncan plays for Cleveland, but I have a personal goal to see as many ballparks as possible and Goodyear’s is still on my list to check off. After some daytime baseball we’re going to check out O.H.S.O. Eatery + nanoBrewery. They only have two of their own beers, but they also have dozens of other Arizona and national microbrewery varieties on tap, which makes this a good place to try out beers from places in the state we won’t get to visit. Day Three — I will be getting up bright and early to say hello to the past, current and future Albuquerque Isotopes as they continue Spring Training at Los Angeles Dodgers camp out in Glendale. The media gets access from 8 to 9 a.m. and then after the game. Look for full reports at my other online writing endeavor. While E-Rock gets to hang around Camelback Ranch as a fan and then wait for me to finish up, our next brewery target is SunUp Brewing. We are both looking forward to the Vanilla Porter. Day Four — E-Rock is flying home to rehearse (did I mention he’s a darned good, and busy, musician? ), leaving me to fly solo for the day and attend a Cubs game in Mesa. After meeting up with an old friend who I’ve known since third grade, or almost 26 years, we will check out the Diamondbacks/Rockies facility, Salt River Fields at Talking Stick, for a night game. This will be the only brewery-free day of the trip, but I will endeavor to find anything local at the two ballparks (or at least refrain from anything in the Bud/Coors/Miller families). Day Five — My final baseball stop takes me to the other side of downtown Phoenix, where the Brewers train in Maryvale. After that I hope to join up with some old college friends to watch basketball and enjoy the beers at SanTan Brewing, which E-Rock visited in his last trip down here and graciously reviewed for us. Day Six — It will be time to trek back down to visit my old haunt, Tucson, where I lived for seven years while allegedly going to the University of Arizona and been given a degree in journalism just so I would go away. The immediate goal is to stop by Borderlands Brewing, which is only open a few times a week and Friday happy hour just happens to be one of those times. It is one of two breweries that have opened since I left Tucson in 2003. The other is Barrio Brewing, and if I have time (they are not that far apart) I will stop there as well. Day Seven — St. Patrick’s Day. Shenanigans will occur. What exactly, I cannot predict. We left behind snow and wind and our friend Boost for 80-degree days in Arizona. Day Eight — Day of Recovery. Other than my fantasy baseball keeper league draft (if you’re shocked that I’m that big of a sports nerd that I pay $100 a year to do this, you have not been paying attention) over the internet, my main plan will be to regain the parts of my soul I lost to the previous night’s shenanigans. Day Nine — The Tucson-to-ABQ drive is one I have done so many times I don’t even need road signs anymore. I could probably do it with my eyes closed, but the highway patrol usually does not like that. The only difference this time will be in where I stop for lunch in Deming, NM. Instead of a fast food joint off I-10, I will hit up Mimbres Valley Brewing. Look for a full review next week! That is all for now from the Valley of the Sun. I am off to pick up the two important things I forgot — a hat and sunscreen. It’s in the 80s all week and I’m Scottish-Irish-Polish, so I have no choice.